Deb's Cup of Tea: There was some rain overnight on Friday. A number of my friends have sent emails expressing concern about some "excessive dampness" that occurred over the weekend. 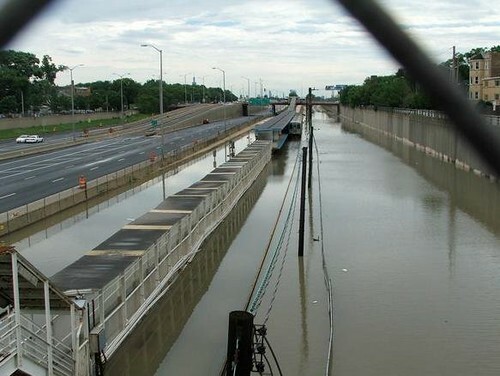 Herewith are just a couple of photos taken off the Chicago Tribune's web site photo gallery of "overly wet weather" from the weekend. Carole will recognize the spot above. This is the intersection of Main Street and Roosevelt Road just south of downtown Wheaton. To the right, is the former Hubble Middle School where she went to school. The Wheaton Park District's main street offices are to the left of the sign. There is a large grassy area, tennis courts and a football field here. My vet's office is 3 blocks north of this location. It has ALWAYS flooded here when we get an inch of rain. I'm given to understand flooding has been a forever problem. With Hubble Middle School replaced by a new school in Warrenville, any development of the old school site is to include an assessment of flooding problems. I awoke at 12:45 a.m. Saturday morning. Mija was upset by the noise and sitting in the bedroom window after bouncing about the bed. I could hear heavy rain on the roof. "Uh, oh," I thought. "Did I pick that stuff up off the basement floor?" I knew, from the sound, that I'd probably have water in the basement in the morning. My boss said he heard it at 4:15 a.m. There must have been more than one cell go through. Come Saturday morning, the usual amount of water was in the basement. It was about 50% dry by last night. So how much did I get? The report I read said 6.5 inches of rain. My boss said he read 7 inches. 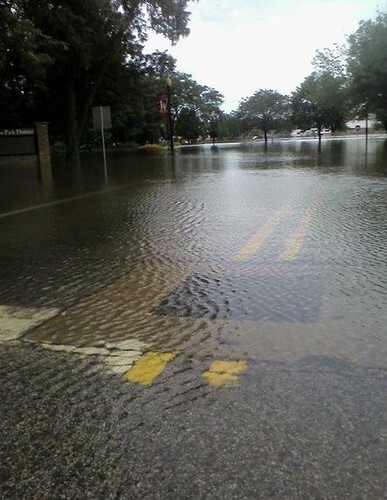 Since moving to the Chicagoland area in July of 1981, I have been through 4 of these deluges. I don't remember this kind of thing growing up. Flooding usually came from the spring snow melt, not from huge amounts of water coming out of the sky. It's possible I just don't remember rains of this nature for, as a kid, I may have been allowed to stand outside in it. Whatever the rain totals, it created monster headaches for travelers on Saturday. I didn't go anywhere. No way am I going out when I saw on my computer news feed that sections of streets in Wheaton and Glen Ellyn were closed due to high water. I don't need to go gawk when others will do it for me. I did not know until yesterday, when I was reading the Sunday paper, about the Eisenhower Expressway into the city being closed. Um...yeah. That's a good reason to close it. This is the elevated railway, called "the el" which runs alongside the Eisenhower. The area joke is "you can't get there from here". On Saturday, that was most certainly true. I do have one very funny story. The cats are not happy that they can't go into the basement and lie on the cool concrete. It will be dry by tomorrow. On Saturday night, roughly 8:15 or so, there was a crash in the living room. Someone had knocked over the box fan I have running to keep the air circulating. Now, Saturday night is usually prime World of Warcraft night so I was online, with my guild, running a tough raid named Ulduar. Fortunately, we had just started and were getting assignments for the first boss when this happened. I jumped up. Mija, who had been asleep on the bed, dashed into the living room and was met by a wet and angry black cat. There was hissing and Pilchard took a swipe at her. Mija retreated to the hallway while Pilchard dashed under the table. She was dripping. I grabbed a beach towel, threw it over her and carried this thrashing cat into the bathroom. In spite of hissing, spitting and much growling, I was able to towel dry her, check for injuries and then try to figure out what happened. Judging from the wet footprints in the living room, kitchen and up the basement stairs and a small spot on the basement floor that appeared to have been sopped free of water, Pilchard decided the water in the basement did not exist and she jumped off the basement steps onto the basement floor. Once there, she discovered that water did, in fact, exist and she tried to get away from it, wiping out in the process. Because both sides and her belly were wet, she must have slipped and fallen a couple of times before reaching the steps and charging back up the stairs. She raced through the kitchen and into the living room, but the "wet brakes" didn't work and she collided with the fan, knocking it over, which was the noise I heard. She sat under the table in the living room, giving herself a bath for at least an hour. I refilled my tea cup twice during that time and she was cleaning away both times. She had discovered that the airflow from the fan dried her fur a bit faster so she was near it. All day yesterday, when I went into the basement to do laundry, they sat at the top of the stairs looking mournfully down into the basement. I am thankful right now, that I never got around to moving the litter boxes to the basement. That would have been a mess for sure. Pilchard is not shy about peeing on things if she feels the boxes aren't clean enough for her. I can't imagine what I would have awakened to Saturday morning. Things will be back to "abby-normal" probably by Wednesday for sure. There is more rain predicted for later in the week, but we can hope it's just the usual summer showers and not the overturned bucket kind of rain. And to those who are wondering, I don't have friends or family directly affected by the Delhi Dam breaking. If you have not seen the video footage, I recommend watching it. We try to control Mother Nature and she reminds us that she will always have the upper hand.